For many families, particularly with younger children, Christmas is a special time and it can be made even more special by Mum or Dad taking their children to skate, perhaps for the first time. In Britain, it never seems to snow anymore however, to children, Christmas is a time of snow, ice, and magic. What the British climate doesn’t provide, your private or public sector organisation can provide a brilliant and much appreciated replacement. For new shop or shopping centre openings, nothing draws the crowds like a temporary Christmas ice rink. 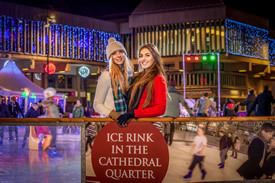 For existing businesses and public sector organisations, a real ice rink provides a massive media and PR opportunity to draw attention to what you want people to know about your business or local authority. High Streets and town & city centres have suffered since the crash of 2008 and the gradual migration of consumer spending online. Councils, LEPs, and BIDs are intelligently and diligently fighting back by making shopping a people experience again. 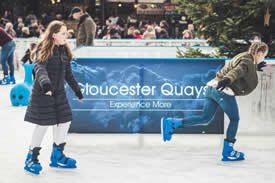 The installation of a temporary Christmas ice rink will drive significant numbers of people into our town and city centres – many of whom may not have been for years. By giving them a reason to visit again, they’ll see the changes, improvements, and evolution of their own town and city centres and this could be the beginning of a journey where consumers remember the real importance and the vitality of their High Street and local independent business again. Whatever the reason you’re thinking of installing a temporary real ice rink, please call or email and ask our team what needs to happen so that you and your organisation achieve the result you want.